Occasionally clunky, and sporting an unremarkable combat core, but offers an irresistible slice of stealthy co-op coordination. It may be the future, but the Kevlar-padded embrace of the Clancyverse feels much the same as ever, with its geopolitical gibberspeak of Zambian warlords, Bolivian gunrunners, PMCs, coup d'etats and Russian rogue spears. 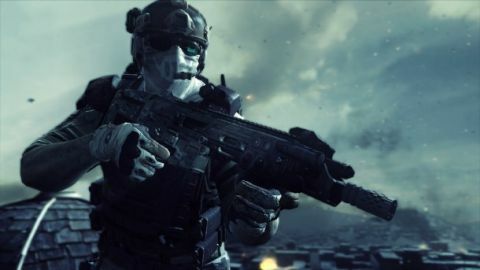 In other ways, too, Ghost Recon seems to have gone forward to come back: recent console outings have seen the military shooter series regress to a bro-squad arcade gunblam rollercoaster, all slow-mo exploding helicopters, tactical nukes and fist-bumps. With this latest instalment, however, there are substantial concessions to its more subtle, tactically-minded origins. Sure, it resorts to gruesome-looking cinematics, tired turret sections and bombastic slaughter, but when it's at its best, Future Soldier discards the pop-up scripted corridors that have recently maligned the series and becomes a sandbox of sightlines and sentries, a battlefield puzzler solved with well-timed bullets. You are one of four shadowy operatives dispatched on a global killing spree, tracking international ne'erdowells across multiple continents and, very often, blowing them to bits. Infiltration usually precedes the pyrotechnics, however, so you'll need to eliminate or circumvent threats without raising the alarm. Lucky you're invisible, eh? In this near-future setting, optical camouflage now shrouds the US army's elite forces. Crouch and your camo activates, turning you into a translucent smear – subtle enough that you can scamper past the unwary, but not so perfect that you won't be rumbled if you dawdle in front of them. Although you control just one Ghost, you can mark up to four targets at a time. Not only does this track their positions on your HUD, but your fellow operatives reposition to ensure they have a bead. When a buddy's crosshair is locked on someone's skull, their sightline is marked for you too, indicating which enemies are taken. Then either at your command, or in synch with your first shot, the team drops their targets. It's thrillingly empowering, all the more so using the aerial drone, which lets you select enemies from on high. In some missions, I elected to stay plugged into the drone the whole way, ordering the other Ghosts to whittle down the foe three silent takedowns at a time. Such missions become a puzzle, unpicked by establishing who can see who, and by killing the lonely and unobserved first. There's a delightful action element, too: when a four-man sync shot goes down, time slows, enabling you to plug a few more before the alarm goes up. Your teammates are quick to call and describe threats, and do so with some detail – describing enemies as beside shipping containers or on walkways. That said, it's never clear if they're calling threats you've already marked, nor is “on the left” a useful designation when you have no idea of your squadmate's orientation. On a couple of occasions they got it dead wrong, too: urgently insisting on an enemy presence when there was none, and, another time, happily declaring the all-clear while I remained under heavy fire. Fortunately, the campaign is almost entirely enabled for four-player co-op, so you can replace your CG companions with fleshier friends, should the game's many connection issues permit. There's no guarantee your team will become more effective, however. If anything, coordinating the flighty attention spans of game journalists proved a lot harder than ordering AI around, but when a plan comes together it makes for unsurpassed triumph. This patient elimination of threats creates an entrancing methodical vibe – oddly more reminiscent of the earlier Splinter Cells than Ghost Recon. In fact, a late level in which you infiltrate a prison without the assistance of your team feels almost like an off-cut from one Sam Fisher's adventures, albeit lacking his lethal acrobatics. It's probably my favourite mission in the game, too, because the stakes are higher and stealth your only redoubt. Another high-point sees you shadow a local warlord as he saunters through a refugee camp. Though much more reliant on scripting than most missions, the tension between stealth and pursuit is deftly staged. Scurrying after your quarry, you suddenly spot sentries who must be toppled from their lookouts, and improvise rapidly, working out how to silence a guard post moments after the warlord wanders through. Unfortunately, being spotted can often be blamed on the game's many acts of self-sabotage that undermine the consistency of its stealth system: enemies visibly pop into existence when a script triggers reinforcements; bodies (which you are unable to drag away) sometimes vanish into thin air and sometimes don't. Since a spotted body triggers alarm, it seems odd that something so critical is handled so carelessly. While many missions fail you instantly for indiscretion, most eventually let you 'go loud', and barrel your way to a sky-high body count. Though the variation of pace is mostly welcome and its climactic action spectacles offer well-intentioned catharsis, there's something a tad disappointing in the way the stealth game shatters, and reforms as an altogether more anodyne stop-and-pop shooter. There are boss battles in which you fend off the attentions of enemy choppers or tanks, or simply hold out for rescue against oncoming waves. Turret sections see you climb aboard a vehicle and rattle off a gazillion rounds into a mindless horde of foreigners. Then there are the 'diamond formation' set-pieces, where the game temporarily transforms into a rail-shooter. All adequate, but overly-familiar. Once battle starts, your optical camouflage peels away, as though suddenly embarrassed. Everyone now knows where you are, and they aren't the convenient amnesiacs of other stealth games: when the fight is on, they don't let up. But despite their good memories, these AI goons still aren't high-achievers in the videogame badguy league tables. They flank and pressure you, but they often skip gaily into your gunfire too, or take up useless cover-positions where their comrades have been freshly felled. All the same, gunplay offers an ample selection of tools and tricks. Different visor modes and gunsight attachments enable low-light vision, heartbeat sensors and a short-range X-ray. Your normal HUD also erratically picks out enemies and paints them with a distracting coloured overlay – orange at first, then red when alerted. Since this makes them visible through walls, it can be unclear if you actually have a shot on them or not. I still don't understand quite why it highlights some enemies and not others, nor why this highlighting flickers on and off. When it does, the soldier's model disappears entirely for a moment, before popping back. It contributes to a pervading low level crumminess. On more than one occasion I found my deadeye shot catching on some invisible barrier, or a hapless teammate stuck in a perpetual run-cycle. It's not always a pretty game either. Though the proprietary YETI engine stumps up slick-looking manmade structures, and lights them well, its attempts at natural landscapes are grim. Helicopter fly-bys of deserts and tundra are dismal low-poly affairs with bleary textures. Even as one detail impresses – a sandstorm sweeping through an aircraft's crashsite – another strikes you as dementedly terrible, such as the peculiarly wonky animation given to birds. Then there are the monstrous character models, whose faces look like they've been inexpertly felttipped onto sack-cloth. Thank God they mostly keep their helmets on. But these potato-faced creatures seem like a real dish next to the netcode, which at the time of writing can't hold together a single game for more than a few minutes. It's a shame, because the tantalising glimpses of multiplayer I've been offered showed multiple modes and tactical nuance. Optical camouflage makes it easy for snipers to pick off indiscrete assaults, so positioning and coordination becomes all the more key, while a technology arms-race constantly shifts the power around the battlefield. Take the chance to stun an opponent and hack their comms, and you suddenly have the positions of all their teammates – handy for predicting a massed attack and providing an XP boost for every kill assisted by this information. Of course, all this effort is for nought if you can't actually play the game, and elsewhere, Future Soldier's occasional spasms, glitches and crudities erode its promise of precise, ruthless tactics. Its action spectacles, meanwhile, don't match the rare exhilaration of its stealth sequences, nor the visual flare of its corridor-shooter competitors. Nonetheless, there are few other recent games that keep step when it hits its stride: four players working together to cleanly erase an enemy force in neatly orchestrated silence. In a genre at risk of becoming homogenous, Future Soldier's exceptional stealth is worth going loud about.